Welcome to Diamondshere.com where you will NEVER PAY RETAIL AGAIN! For the finest in custom and manufactured fine jewelry...be sure to check out our Diamondshere.com specials on the American Eagle gold coin pendants...Diamondshere.com also has a terrific selection of diamond solitaire pendants in a variety of sizes and shapes! 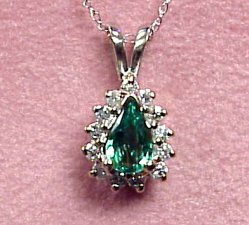 Be sure to check out our selection of ruby, sapphire and emerald pendants...all at wholesale prices delivered to your door! 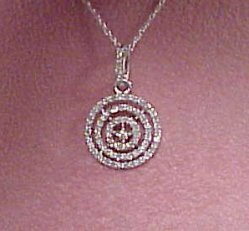 Diamondshere.com has one of the best fine jewelry guarantees in the industry! 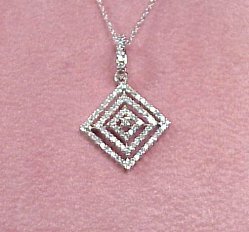 Thank you for visiting Diamondshere.com...put us in your favorites and check us out! Fresh from our award winning goldsmith and just in time for the holidays. This 3.12CT Ceylon Blue Sapphire is custom mounted in this wonderful 14k white gold design. An elegant custom piece of fine jewelry you will be proud to wear. 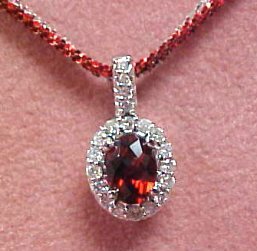 Fiery red 1.0 carat garnet set with 20 round brilliant diamonds (0.23 cttw) in 14k white gold. We matched it with the latest style in red colored white 14k gold chains. The chain can be adjusted from 16 to 18 inches long. All Ruby, Emerald, or Sapphire and Diamond Pendants are ON SALE NOW! Call for our CASH SALES PRICE! Your satisfaction is guaranteed at DiamondsHere...AND...NO SALES TAX IN OREGON! 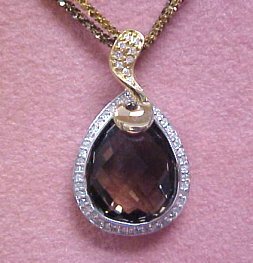 Stunning 7.43ct smokey topaz set with 53 diamonds (0.23 ctw) and mounted in 14kt white and yellow gold. This chain design allows you to adjust the length from 16 to 18 inches and is colored brown and amber 14k gold. This 15 carat blue topaz cabachon is stunning. Set with .15 ctw of round brilliant diamonds in white gold. We have the piece matched with our colored blue gold, adjustable chain. 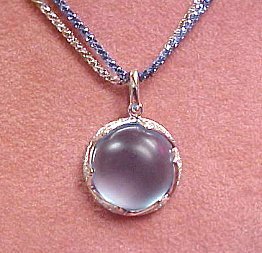 Any woman would love to own this beautiful pendant. This would make a perfect gift for yourself or someone special. 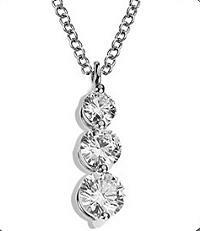 This lovely diamond pendant is 14k white gold with 0.29 ctw round brilliant diamonds of G Color, SI Clarity. These diamond pendants are HOT! Very flashy and stylish. Constructed of 14k white gold with 0.32 ctw round brilliant diamonds of G/H Color, SI Clarity. WOW!! Fresh from our award winning jeweler. 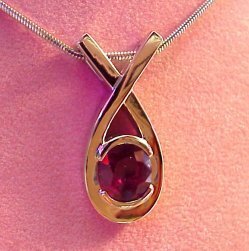 He has set this beautiful, natural 4.84ct Burma ruby in a custom 18k solid white gold slide pendant. The ruby has exceptional color and brilliance. It will be hard to find a natural ruby of this quality and carat size. 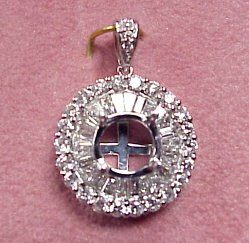 Just imagine your favorite 7mm colored gemstone set in this fine diamond circle pendant. There are 25 round brilliant diamonds and 28 tapered baguettes of G-H color, VS-SI Clarity for a total weight of 1.19 carat and set in 18k white gold.. 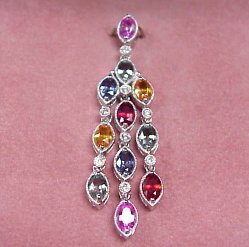 This Rainbow of Sapphire pendant has 3.46 tw of marquise cut gem colored sapphires set in 18k white gold with 8 round diamonds for a added touch of elegence. The colors are alive and bright and we have a set of matching earrings to complete this awsome set. Hand picked for its bright, clean color, this 1/3 carat gem pear shaped emerald has all the qualities you are looking for.. Set with 13 round brilliant diamonds of G/H Color, SI Clarity in beautiful 14k white gold. 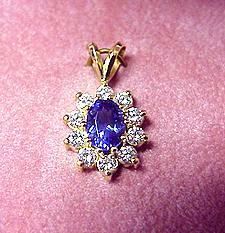 Dazzling 0.97 ct. Fine Gem AAA+ oval cut tanzanite with 0.58 ctw, color G, clarity SI1, set in 14k yellow gold. This pendant is a knock-out!